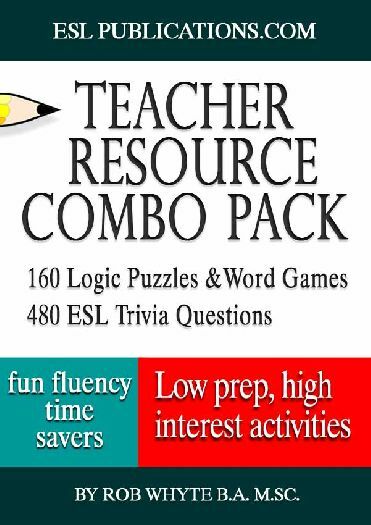 The Teacher Resource Combo is great value for English teachers looking to add hours of fun classroom activities to their personal collection of materials. ESL Trivia Challenge Volume 1. 240 trivia questions written exclusively for non native speakers. This pack is ideal for beginner to low intermediate level students. ESL Trivia Challenge Volume 2. 240 new and different questions (no repeats) ideal for intermediate to advanced ESL students.